Since 1964, Bruce Patterson (Customer Service Account Manager-Bristol) has been donating blood. In early April he pushed his total blood donations over the 29 gallon mark. 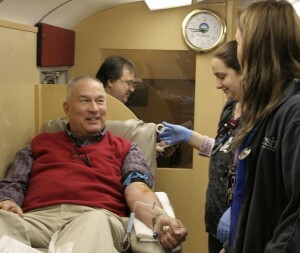 His donations have gone to Wellmont, the American Red Cross, Med-X and the U.S. Army, while also contributing to pheresis. When asked about what drove him to faithfully donate, he responded that it is needed to save lives and that the demand is limitless. The tradition of giving was ingrained by his mother, who was a Red Cross Volunteer. Bruce would like to reach the thirty gallon milestone if he is healthy enough to make it and deeply encourages others to follow in the footsteps of donating life to others.